I have a little announcement to make, before I go ahead with my post today. Finally, after a lot going back & forth, I have got a domain name for myself and it took 3+ years for me to do that!. So, from now on, this little, tiny tot will be called as 'Cooking with Siri' - www.cookingwithsiri.com (instead of Siri's Corner, as it was formerly known). "....food writing is a skill that must be practiced repeatedly. You must spend an extraordinary amount of time learning about food and writing, says O'Neill, just as you would spend years learning how to play the piano well. But persevere and most likely it will pay off in the end.."
~ this is an excerpt from Dianne Jacob's book (which I am totally in love with) - Will Write For Food. The same holds good not only for *food writing* but for any new (ad)venture that we take upon. Isn't it. As somebody, who runs this blog all-alone (like many others out there) - from being a recipe developer to chef to food stylist to food photographer, it takes immense amount of time & effort to slowly master each one of the fields. And I think, taking good photographs is the key for running a successful blog. It is important to engage and entice the audience which would make them want to rush to their kitchens to whip up the dish for themselves. 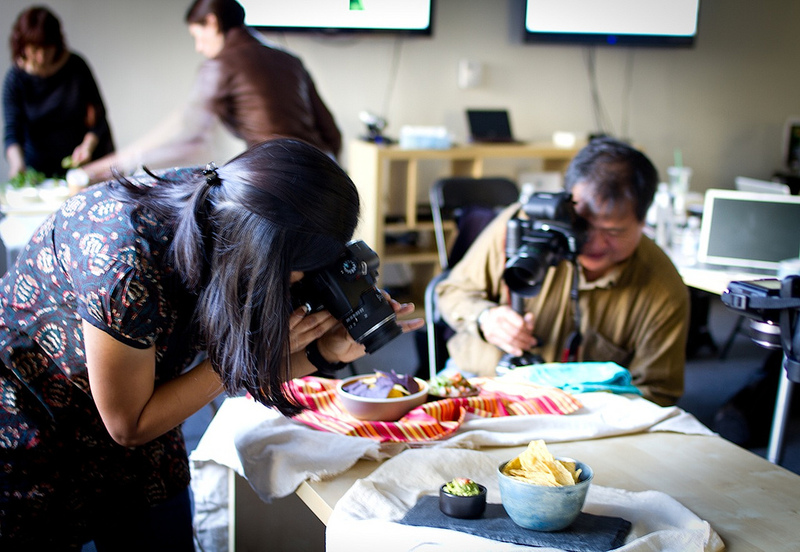 I have to say - am taking baby steps towards becoming a good photographer and to enhance my skills and to get a new viewpoint about how to take good photographs, I recently attended a day-long Food Photography Workshop, here in San Francisco, organized by Digital Media Playground and Danielle Tsi. It is always fun to meet some fellow bloggers who share the same passion for food and its photography. Here is a flickr stream that Denise has put together from the photos taken at the workshop. If you are interested, they have one more workshop coming up for January 8th 2011. Click here for more details about how to register. ..and below are some shots taken by yours truly! ..Now let's see what is cooking in my kitchen tonight, Shall we? It is sugarless, butterless cake made with whole wheat pastry flour, fresh ginger, nuts and dried fruit. To give some sweetness to the cake, I have used - for the first time, some Blue Agave Sweetener (can be easily substituted with honey as suggested in the original recipe). According to wikipedia article - "Agave nectar (also called agave syrup) is a sweetener commercially produced in Mexico from several species of agave, including the Blue Agave (Agave tequilana), Salmiana Agave (Agave salmiana), Green Agave, Grey Agave, Thorny Agave, and Rainbow Agave. Agave nectar is sweeter than honey, though less viscous...."
Yes, I did feel this was bit sweeter and less syrupy than our regular honey. A lot has been said about this blue agave syrup in recent times. It is topic of debate - with some saying it is a healthy alternative because of it low glycemic index but some argue - the agave syrup available in markets right now has high amounts of corn syrup which doesn't make it any better than our regular sugar. But, I believe Sugar at the end of the day is S.U.G.A.R. - whether we get that from honey or brown sugar or regular white sugar or this blue agave nectar, it doesn't matter. Enjoying it (in any form) in moderation is the key and you don't need worry about anything else! Honey was replaced in this cake with the Blue Agave Sweetener truly for experimental purposes and I loved it. I made two loaves - one for my dear husband & other for my colleagues at work. All of them gave thumbs up to it and I am a happy girl at the end of the day! After all, it is holiday-time. Make this for this Christmas or New Year and spread some healthy holiday cheer around. Other topping ideas - Sprinkle confectioner's sugar or toasted coconut or chocolate curls or chopped roasted nuts. Step 1. Preheat oven to 350 F, rack in the middle. Grease a loaf pan or a cake pan with oil spray. Keep aside. Dry ingredients: In a large bowl, mix in whole wheat pastry flour with baking powder, salt, cinnamon, fresh ginger and lemon zest. Wet Ingredients: In a bowl, Whisk for atleast 3-4 mins, eggs and blue agave nectar or honey until they are slightly emulsified (well combined into a brownish liquid). Slowly, in a steady stream add warm milk. Add oil and vanilla extract. Mix well, one final time. Step 3: Mix with a wooden spatula, the dry ingredients to the wet ones, little at-a-time. Don't worry, batter may be a little thin. Fold in chopped nuts and dried fruit. Mix once. Step 4: Pour in the greased loaf or cake pa. If using chopped almonds (or any nuts) as topping, sprinkle them on the cake.Bake for 40-45 mins. (depending the size of your pan), until the cake is puffed and deep golden brown. Mine was done in 38 minutes. Doneness test - A toothpick inserted in the center of the cake will come out either clean or with only a few crumbs clinging to it. Step 5: Cool for 10 minutes. If using confectioner sugar or toasted coconut or chocolate curls, sprinkle on the top of th cake. Serve. If you have any feedback, please use this updated form or email me at: blog[at]cookingwithsiri[dot]com. and here is how my new FB page looks like - . Hope you all have relaxing weekend ahead. Congrats on the new domain Siri. The loaf and pictures look great! Congrats on ur new domain...Lovely Pic and delicious cake! !